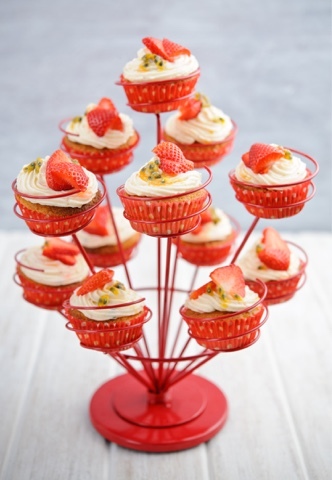 Today is the start of National Cupcake Week, and throughout the week we will be sharing cupcake recipes with you. The first recipe is from berryworld.com and it looks delicious. BerryWorld produce premium fresh strawberries, raspberries, blueberries and blackberries. They have lots more recipe ideas on their website here. Gorgeous cupcakes, a perfect special treat for any occasion. Line a 12-hole muffin tin with paper cases and heat oven to 190°C/fan 170°C/gas 5. In a jug, mix the yogurt, eggs and vanilla extract. Put the dry ingredients, plus a pinch of salt, into a large bowl and make a well in the middle. Add the yogurt mix and melted butter and quickly fold in with a spatula or metal spoon, don't over mix it. Spoon into the cases and bake for 20 minutes or until golden, risen and springy to the touch. Cool on a wire rack. In a large bowl whisk the cream cheese and butter until smooth then add the icing sugar and beat again until you have a smooth stiff icing. Mash 2 strawberries and beat into the icing then add approximately half of the passion fruit seeds and juice, until you have an icing that holds its shape but is easily spreadable. Pipe or spoon the frosting onto the cakes and top each with a strawberry and a drizzle of the remaining passion fruit.